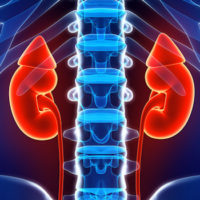 The kidney has a remarkable capacity to repair itself following acute injury, but maladaptive repair can lead to fibrosis (scarring) and chronic kidney disease. Craig Brooks, PhD, and collaborators at Harvard previously reported that after injury, some kidney proximal tubule cells (PTCs) are arrested in the G2-M phase of the cell cycle and participate in maladaptive repair by secreting profibrotic factors. The investigators have now identified a mechanism of kidney fibrosis progression. They showed that cyclin G1 promotes G2-M arrest in PTCs and upregulates the formation of TASCCs, structures previously described in senescent cells (cells that no longer divide).